another method3 production! had some trouble submitting it, so i didn't get it in until now, a day later than planned. ok, resubmitting now so that some stuff can be fixed with the LSD, had a problem submitting because java ran out of memory. COOL! tho from all that suspence i was expectiong a bit more how should i say this, i dunno but this is still better than whatever i can do! =) and its good too! really good! ...when I first looked at this, I thought it was a squirrel. o.O But, once I had decided it was indeed NOT a squirrel, I realized it was an alien. Cute. Cheers for foreshortening. hey now, it's all about the tiger-ific ultra swank backdrop! 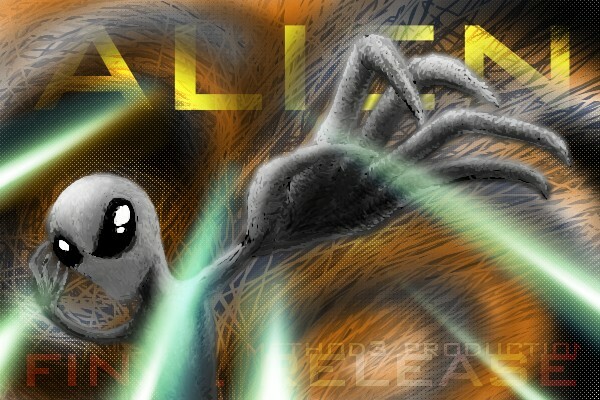 not sleeping tonight.. aliens creep me out like something fierce..
You have an amazing talent for design! Very Very Nice Job!! the last edit is just SWANK. very awesome flashes, method. did the alien say "take me to ur cookies"? i like aliens who do. lol ^^ furry looking alien xD Great great Job!!! this is so freaking cool! i like it! awsome job!! !